Andy and Carlene Ziegler’s Artisan Farms LLC has been named the JC Owner of the Year for a record sixth time. Over nearly a decade, 18 horses owned by Artisan Farms have competed for Canada in Nations Cup competition. In the 2018 season alone, three Artisan Farms horses represented the maple leaf, ridden by Canadian Olympians, Tiffany Foster and Eric Lamaze. 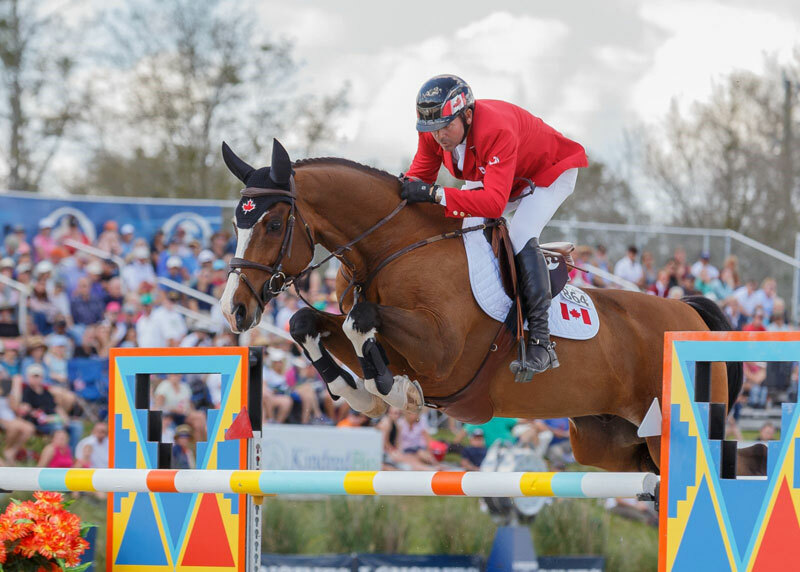 Particularly essential to the Canadian Equestrian Team’s Nations Cup success was 13-year-old Rheinlander gelding, Coco Bongo (Caretino x Calido), with whom Lamaze helped secure the team gold medal at the 2015 Toronto Pan American Games. The bay gelding jumped double-clear rounds with Lamaze at three competitions in 2018: the $450,000 Longines Nations Cup at CSIO 5* Ocala, FL in February; the €200,000 Nations Cup at CSIO 5* Rome, ITA in May; and the $460,000 BMO Nations Cup at the CSIO 5* Spruce Meadows ‘Masters’ tournament in Calgary, AB in September. Victor (Elmshorn x Grandeur), a 16-year-old Dutch Warmblood gelding, also contributed a double-clear round piloted by Foster in June’s $400,000 Longines FEI Nations Cup at CSIO 5* Langley, BC. Their performance helped Canada clinch its invitation to the €300,000 Longines FEI Nations Cup Final, held in October in Barcelona, ESP. Outside of Nations Cup competition, Foster and Victor nabbed first place in May at the CSI 3* in Mannheim, GER. Foster also had an exceptional season riding the 12-year-old Dutch Warmblood gelding, Brighton (Contender II x Quick Star), with whom she competed in the Ocala Nations Cup alongside Lamaze. Together, the duo emerged victorious in the $70,000 CSI 5* Hollow Creek 1.50m Classic during the ninth week of the Winter Equestrian Festival. Foster and Brighton also earned two wins in June at Spruce Meadows, in the ALTAGAS Cup during the CSI 5* ‘Continental’ Tournament and the Friends of the Meadows Cup during the ‘Pan American’ CSI 5* presented by Rolex. Lamaze made his own mark on Spruce Meadows over the summer with another outstanding talent from Artisan Farms: Fine Lady 5 (Forsyth FRH x Drosselklang II), a 15-year-old Hanoverian mare that was Lamaze’s individual bronze medal partner at the 2016 Rio Olympics. The veteran pair earned a remarkable three-peat at the famous show grounds, winning the ‘Continental’ Grand Prix, followed by the Progress Energy Cup and the ATCO Queen Elizabeth II Cup during the Spruce Meadows ‘North American’ CSI 5* presented by Rolex. Also racking up wins internationally was Chacco Kid (Chacco Blue x Come On), a 12-year-old Oldenburg who is owned by the Ziegler family through the Chacco Kid Group. Partnered with Lamaze, the chestnut gelding collected six FEI wins in 2018, including four at the advanced CSI 5* level: the Spruce Meadows ‘Continental’ Scotiabank Cup in June; the Prize of StädteRegion Aachen, GER in July; the Global Champions League of London Round 2 in Great Britain in August; and the Spruce Meadows ‘Masters’ AKITA Drilling Cup in September. Lamaze and Chacco Kid’s consistent performances and lightning-fast speed earned the combination a spot on the Canadian Equestrian Team at the FEI World Equestrian Games™ Tryon 2018 in September. There, they competed against the best show jumpers in the world to help Canada earn a respectable 10th-place finish in the Team Final. Artisan Farm’s contributions to the Canadian Show Jumping Team and their horses’ spectacular success in 2018 were recognized during a special presentation on Nov. 7, 2018 at the Royal Horse Show in Toronto, ON. EC is grateful for the level of dedication, commitment and support that owners generously provide in order to ensure that Canadian Equestrian Team athletes have access to world-class horses, and is pleased to recognize exceptional owners through the JC Owner of the Year Award. To view past recipients, click here.